Online registration for this event is now closed. For further details and enquiries about late booking, please contact Gill Williams. 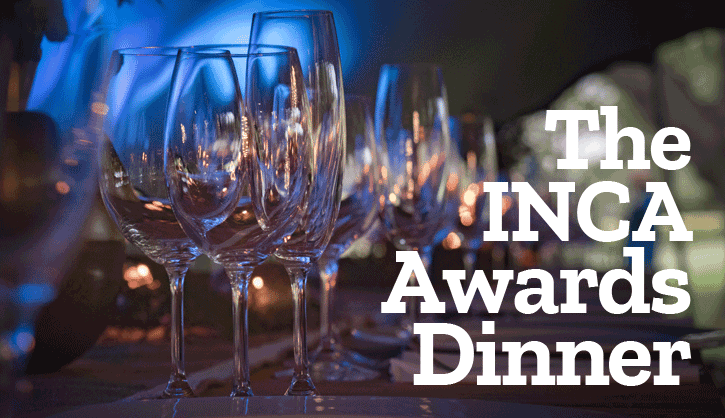 On the eve of our main conference event this year we've arranged a special INCA Awards Dinner at the Amba Hotel Marble Arch. It's an ideal opportunity to join us in celebrating the brightest and the best in our industry. This gathering also offers a chance to relax a little in congenial surroundings and enjoy good company and good food ahead of the main INCA Conference event. If you plan to participate in the INCA conference, which runs from the afternoon of November 5 through November 6, also at the Amba Hotel Marble Arch, find out more and register for the conference. The awards dinner is charged at £150 per person plus VAT (£180 inc. VAT). Alternatively you can book a table for ten people at a 10% discount. If you would like to book for more than ten people, please contact Gill Williams, and we'll be pleased to assist with your booking. If you have an allergy or food intolerance please let us know. An information pack is available in the restaurant from your server listing the allergenic ingredients used in our foods, as required by current UK and EC laws. It also describes any associated cross contamination risk which may affect specific menu items. If you would like to consult it, please ask for it. Please note that the hotel kitchens are not a nut or allergen free environment. If you have any queries about the awards dinner, please contact Gill Williams for details. The INCA Awards 2018 programme is made possible thanks to the generous support of our Awards Sponsors.